My name is Lyssa and I’m a baby carrier convert. This afternoon, Mr K was grizzling after lunch. He was tired following his unwilling participation in an ESL class and the broccoli I had presented him with as finger food with was not to his satisfaction. After trying to settle him elsewhere, I gave up and wrangled him into his carrier, slinging it onto my back like a backpack. He immediately calmed down and, ten minutes later, he was asleep. The baby carrier is a relatively recent acquisition. Up until Mr K was 10 months old, we lugged him around with our arms and I his pram. Shortly after we moved into our new house, though, a neighborhood earthquake drill happened and we were told to make areangementS for something with which we could carry Mr K on our backs. I grudgingly went out and forked over five thousand yen for a carrier that looked like it might do and we proceeded to participate in the drill. And something else happened too. We fell in love with the carrier. It’s relatively easy to use, it frees up my hands, and most importantly, Mr K is happy because he’s still nestled close to me. Yes, it hurts my back and shoulders a bit, but back pain is part of this baby gig and you get used to this particular version and the pay-off is very, very worth it. I have to admit I’m a little frustrated with myself because I knew all this before he was born. 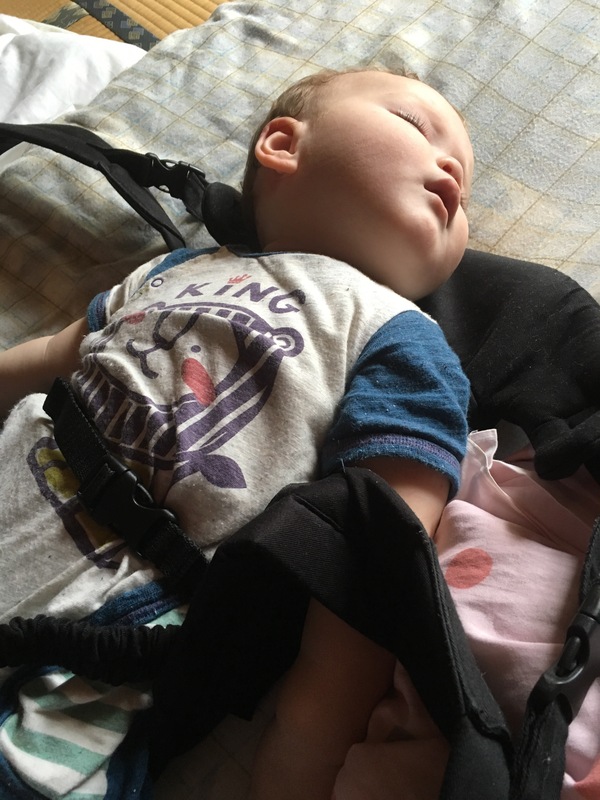 I bought a secondhand carrier because not everyone else entirely sold on it, and it didn’t work out very well, not least because carriers just are kind of awkward for very little babies (you’re better if with some sort of sling, apparently). I bought another one that I didn’t really like, and then I gave up. And I really wish I hadn’t! I could have saved myself a lot of anguish if I’d just stuck to my gunson this instead of letting my eroded self-esteem get a little bit more so. Anyhow, we’ve got it now and Mr K and I are both a little happier for it. And yet I do love Doctor Mario. Image source.